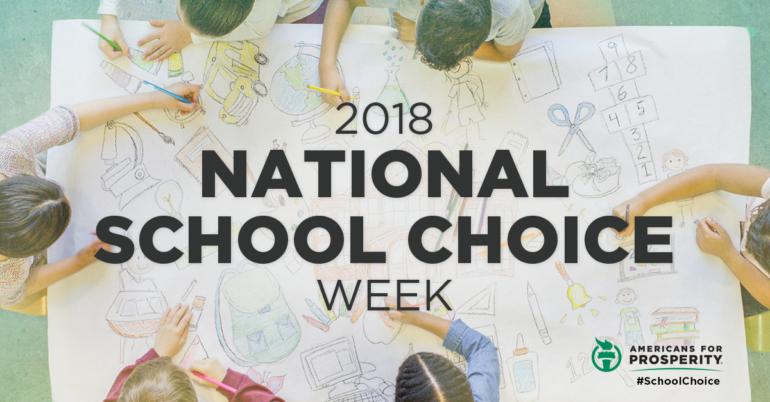 This week is National School Choice Week. To celebrate, Americans for Prosperity is highlighting how education freedom is giving students a brighter future. Each and every child from every walk of life deserves the chance to get the best education possible, so they can live prosperous lives and achieve the American Dream. Getting a good education is the first step toward success. The majority of studies on education choice programs conducted over the last 20 years found that choice programs have a positive impact on the academic outcomes of those who participate. Education freedom has also been associated with higher graduation rates and college acceptance rates. No wonder education freedom is gaining in popularity! 71 percent of the public support education savings accounts. 62 percent support tax credit scholarships. 61 percent support public charter schools. This array of choices is one of many reasons support for education freedom is increasing. Education freedom means families can choose the education option that works best for them. Unfortunately, too many students are denied the opportunity to learn in the way and at the pace that best fits their unique needs. We can’t rest until every student, regardless of zip code or family income, is equipped to pursue their passion and reach their full potential. Whether it’s a traditional public or charter school, or private school or homeschooling, families want to find the education that best fits their child’s needs. 42 percent of parents surveyed for the 2017 Schooling in America report said they would choose a private school for their children as their first option if they could. 15 percent would choose a charter school. 7 percent would choose homeschooling. Education freedom is crucial to helping students get the education they need to succeed. That’s why we need to support and celebrate education freedom. Celebrate National School Choice Week by signing the petition to show your support for education freedom.